Question: I’ll be fishing on the flats for bonefish and permit for the first time this winter, and I want to spend some time practicing. I know you’re supposed to stand on the casting platform with your fly in your hand, but what’s the best way to get from this ready position to actual casting? I’ve been told that you’re not supposed to drop the fly because it might get caught on you clothes or line. But if I don’t drop it, how can I cast? Do I throw it? Strip the line you’ll need off the reel and onto the deck. Then restrip the line so that the front of the line is on top. Tim Romano photo. 1. Prepare your line by stretching it. Grab four feet at a time between your hands and pull hard. 2. Strip the line you’ll need off the reel and onto the deck. Then restrip the line—as if you were retrieving a fly—to make a new pile in which the line going up through the rod guides comes off the top. If you try to cast line coming from the bottom of the pile, you are sure to create a tangle. 3. Work 30 feet of line out of the rod tip. This will enable you to achieve an immediate 40-foot cast (the line plus a 10-foot leader). If you want to let the line drift beside the boat, you can, but be sure there isn’t so much line out that it reaches the trim tabs at the stern or gets in the way of the person poling. 4. 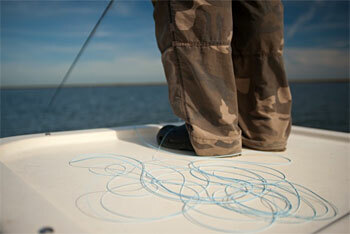 Hold the fly in your thumb and index finger, pinching the rear of the hook bend. 5. Position the rod tip slightly to one side of the bow. This will minimize the effects of wind and allow you to use your rod as a pointer to show the guide where you’re looking, so he can help you spot fish. 1. When it’s time to cast, swing your rod behind you, with an exaggerated motion, to the 2 o’clock position. This will flip your line into the water behind you. 2. Hold your left arm (the one with the fly) out in front of you. 3. Come sharply forward with the rod tip, to make a roll cast in the direction you want to cast. 4. Don’t drop the fly on the deck! Instead, allow it to be pulled from your fingers by the momentum of the line. 5. Let the cast roll out onto the water and use the water tension to load the rod for your backcast. Now you’re ready to start shooting line on the forward cast.